This Victorian home has lots of history with it. Partial basement used to be servents quarters. Many renavations have been completed, but more work is still needed to bring this home back to what it was when built. Wrap-a-round porch, all electric home. It has a firsplace, and 2 other fleu locations off 1 chemney and there is another chemney that needs checked out before it should be used. With a metal roof, 2 bedrooms on the upper floor and 2 bedrooms on the main floor, the master bedroom has a 1/2 barth, and laundry area is just off the kitchen. With eat-in kitchen and separate dining room. If you like Victorian homes you should view this home. 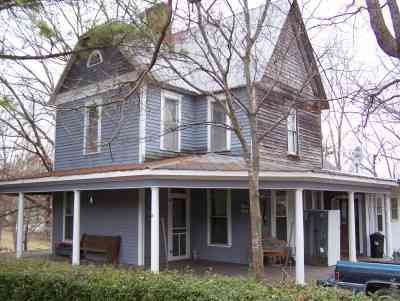 With lots of potential to restore it and make it your dream home!